Natures Images has arranged tours to some of the remotest and most beautiful parts of the planet. 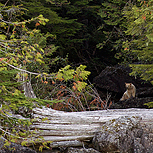 One location that we have been trying to visit is the Great Bear Rain Forest in British Columbia and we are really pleased to have secured the right boat with the right crew to show us the best that the Great Bear Rain Forest has to offer. Late summer and fall in the Great Bear Rain forest brings the wild Pacific salmon back to the streams and rivers of their birth to spawn and complete their life cycle. The returning salmon play a vital role and is such an important food source for the bears, wolves, wolverines, and many species of birds. We have exclusive use of our luxurious cruiser to explore the many areas along the remote BC coast. The very nature of our boat means we can only take four guests for this special trip and so it really will be a unique experience with a small group, it really is the only way to explore BC. Spirit Bears are amongst the rarest animals on earth and during this trip our aim is to take you to some of the very best locations where this beautiful animal can be found. The Great Bear Rainforest also provides great opportunities for photographing Grizzly Bears, Humpback Whales, Orca, Sea Otters, and many species of birds, all amidst some of the most soul stirring landscapes on earth! Day 1: We are due to arrive at Vancouver Airport from our chosen connecting flights. We will then transfer to a local hotel near the airport. Over dinner we will discuss what to expect over the coming days photography. Day 2: We will head back to Vancouver airport for our charter flight to Bella Bella, a remote settlement on the British Columbia coast. With a population of 1,400, Bella Bella is the home to the Heiltsuk First Nation. We head to our local guest house where we are staying for the night. We will have the afternoon to explore the town and do some shopping for anything we feel we will need for our journey ahead. Over dinner we can discuss the plans for the fourth coming trip. Day 3: After breakfast we will then transfer to the harbour where we will be greeted by our host and captain of our luxurious cruiser, which offers unparalleled comfort and privacy as you experience B.C.’s most remote and spectacular settings. After settling in and being given our briefing about the boat and safety aspects, we will be free to enjoy our first few hours aboard and get prepared for our exciting Journey. The BC coast is one of the most beautiful regions of the world and we will travel up the coastline at leisure, stopping off at various places. Days 4 – 9: The whole trip is dedicated to photographing the wonderful wildlife along the BC coast, we are a small group in a huge wilderness. This really is a special experience to be able to explore the BC coast in an intimate way. The location is stunning with vast landscapes and a rich diversity of wildlife. We will be heading to areas where the extremely rare Spirit Bears can be found, searching for food along the coast or fishing in the creeks that wind through the dense forests. We will also be hoping to catch sight of coastal wolves as they search the coasts for food. Other subjects that we might encounter along the way could be Grizzly Bears, Orca’s, Humpback Whales and Sea Otters. In all we could encounter anything as we head up the coast and our captain has many years of experience of sailing these waters and enjoying the wonderful wildlife that can be found along this unique coast. Day 10: We will slowly be heading back to Bella Bella where we will have our last night accommodation. Day 11: After breakfast we are due back to Vancouver Airport to catch our return flights back to our chosen destination. Day 12: Arrive back in Europe after our overnight flights. All Accommodation in hotels and on board the boat, all meals, guiding and BC permits. International and domestic flights to Bella Bella, alcohol, local guide gratuities and sundry items. Hotels are typical North American standard and the boat is very luxurious and to a high standard. No single supplement available on the boat. No long hikes are planned during this trip but we will have to hike towards favourite fishing spots for the Spirit Bears. You need to be fit and agile enough to transfer from the boat to a Zodiac.